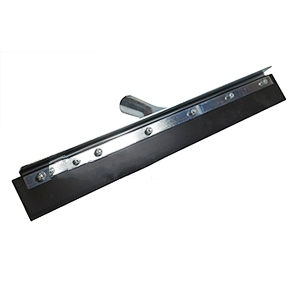 PRODUCT: 36" FLAT BLADE FLOOR SQUEEGEE, 1/4" THICK BLACK RUBBER, REPLACEABLE BLADE SET IN HEAVY DUTY STEEL FRAME. PRICE/EACH. APPLICATIONS: Recommended for use with polyurethane coatings, epoxies, floor coatings etc. Flexible EPDM blade with serrated edge allow optimal flexibility and control of material deposit through pressuure, angle and options of notches.